Example: Two succulent plant genera, Euphorbia and Astrophytum, are only distantly related, but the species within each have independently converged on a similar body form. Convergent evolution is the independent evolution of similar features in species of different lineages. Convergent evolution creates analogous structures that have similar form or function but were not present in the last common ancestor of those groups. The cladistic term for the same phenomenon is homoplasy, from Greek for same form. The recurrent evolution of flight is a classic example of convergent evolution. Flying insects, birds, and bats have all evolved the capacity of flight independently. They have "converged" on this useful trait. Functionally similar features arising through convergent evolution are termed analogous, in contrast to homologous structures or traits, which have a common origin but not necessarily a similar function. The British anatomist Richard Owen was the first scientist to recognise the fundamental difference between analogies and homologies. 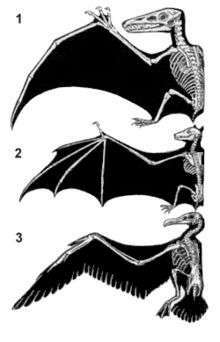 Bat and pterosaur wings constitute an example of analogous structures, while the bat wing is homologous to human and other mammal forearms, sharing an ancestral state despite serving different functions. The opposite of convergent evolution is divergent evolution in which related species evolve different traits. On a molecular level, that can happen from random mutation unrelated to adaptive changes; see long branch attraction. Convergent evolution is similar to but different from parallel evolution. Parallel evolution occurs when two independent but similar species evolve in the same direction and thus independently acquire similar characteristics; for instance, gliding frogs have evolved in parallel from multiple types of tree frog. Many instances of convergent evolution are known in plants, including the repeated development of C4 photosynthesis. Mammals and insects are part of different homologous and analogous evolutionary groups. In the horizontal direction, the structures are homologous in their morphology, or anatomy, but different in their function due to differences in habitat. In the vertical direction, the structures are analogous in function due to similar lifestyles of organisms but anatomically different since they are part of different groups. In morphology, analogous traits will often arise where different species live in similar ways and/or similar environment, and so face the same environmental factors. When occupying similar ecological niches (that is, a distinctive way of life) similar problems lead to similar solutions. In biochemistry, physical and chemical constraints on mechanisms cause some active site arrangements to independently evolve multiple times in separate enzyme superfamilies (for example, see also catalytic triad). Convergence has been associated with Darwinian evolution in the popular imagination since at least the 1940s. For example, Elbert A. Rogers argued: "If we lean toward the theories of Darwin might we not assume that man was [just as] apt to have developed in one continent as another?" In his 1989 book Wonderful Life, Stephen Jay Gould argued that if the tape of life were re-wound and played back, life would have taken a very different course. Simon Conway Morris disputes this conclusion, arguing that convergence is a dominant force in evolution, and given that the same environmental and physical constraints are at work, life will inevitably evolve toward an "optimum" body plan, and at some point, evolution is bound to stumble upon intelligence, a trait presently identified with at least primates, corvids, and cetaceans. Convergent evolution is a topic touched by many different fields of biology, many of which use slightly different nomenclature. This section attempts to clarify some of those terms. Diagram of cladistic definition of homoplasy, synapomorphy, autapomorphy, apomorphy and plesiomorphy. In cladistics, a homoplasy or a homoplastic character state is a trait (genetic, morphological etc.) that is shared by two or more taxa because of convergence, parallelism or reversal. Homoplastic character states require extra steps to explain their distribution on a most parsimonious cladogram. Homoplasy is only recognizable when other characters imply an alternative hypothesis of grouping, because in the absence of such evidence, shared features are always interpreted as similarity due to common descent. 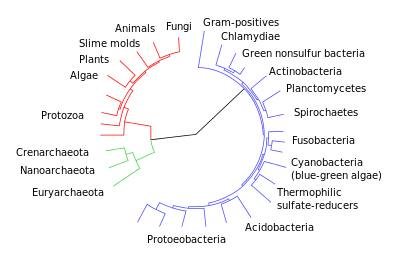 Homoplasious traits or changes (derived trait values acquired in unrelated organisms in parallel) can be compared with synapomorphy (a derived trait present in all members of a monophyletic clade), autapomorphy (derived trait present in only one member of a clade), or apomorphies, derived traits acquired in all members of a monophyletic clade following divergence where the most recent common ancestor had the ancestral trait (the ancestral trait manifesting in paraphyletic species as a plesiomorphy). In some cases, it is difficult to tell whether a trait has been lost then re-evolved convergently, or whether a gene has simply been 'switched off' and then re-enabled later. Such a re-emerged trait is called an atavism. From a mathematical standpoint, an unused gene (selectively neutral) has a steadily decreasing probability of retaining potential functionality over time. The time scale of this process varies greatly in different phylogenies; in mammals and birds, there is a reasonable probability of remaining in the genome in a potentially functional state for around 6 million years. For a particular trait, proceeding in each of two lineages from a specified ancestor to a later descendant, parallel and convergent evolutionary trends can be strictly defined and clearly distinguished from one another. However the cutoff point for what is considered convergent and what is considered parallel evolution is assigned somewhat arbitrarily. When two species are similar in a particular character, evolution is defined as parallel if the ancestors were also similar and convergent if they were not. However, this definition is somewhat murky. 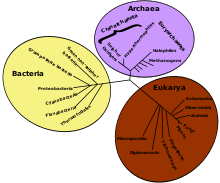 All organisms share a common ancestor more or less recently, so the question of how far back to look in evolutionary time and how similar the ancestors need to be for one to consider parallel evolution to have taken place is not entirely resolved within evolutionary biology. Some scientists have argued parallel evolution and convergent evolution are more or less indistinguishable from one another. Others have argued that we should not shy away from the gray area and that there are still important distinctions between parallel and convergent evolution. When the ancestral forms are unspecified or unknown, or the range of traits considered is not clearly specified, the distinction between parallel and convergent evolution becomes more subjective. For instance, the striking example of similar placental and marsupial forms is described by Richard Dawkins in The Blind Watchmaker as a case of convergent evolution, because mammals on each continent had a long evolutionary history prior to the extinction of the dinosaurs under which to accumulate relevant differences. Stephen Jay Gould describes many of the same examples as parallel evolution starting from the common ancestor of all marsupials and placentals. Many evolved similarities can be described in concept as parallel evolution from a remote ancestor, with the exception of those where quite different structures are co-opted to a similar function. For example, consider Mixotricha paradoxa, a microbe that has assembled a system of rows of apparent cilia and basal bodies closely resembling that of ciliates but that are actually smaller symbiont micro-organisms, or the differently oriented tails of fish and whales. On the converse, any case in which lineages do not evolve together at the same time in the same ecospace might be described as convergent evolution at some point in time. The definition of a trait is crucial in deciding whether a change is seen as divergent, or as parallel or convergent. In the image above (with a caption that begins "Evolution at an amino acid position"), note that, since serine and threonine possess similar structures with an alcohol side-chain, the example marked "divergent" would be termed "parallel" if the amino acids were grouped by similarity instead of being considered individually. As another example, if genes in two species independently become restricted to the same region of the animals through regulation by a certain transcription factor, this may be described as a case of parallel evolution — but examination of the actual DNA sequence will probably show only divergent changes in individual base-pair positions, since a new transcription factor binding site can be added in a wide range of places within the gene with similar effect. Evolutionary convergence of serine and cysteine protease towards the same catalytic triads organisation of acid-base-nucleophile in different protease superfamilies. Shown are the triads of subtilisin, prolyl oligopeptidase, TEV protease, and papain. The enzymology of proteases provides some of the clearest examples of convergent evolution. 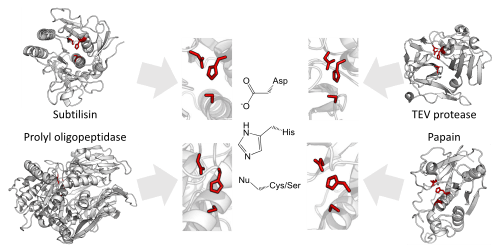 These examples reflect the intrinsic chemical constraints on enzymes, leading evolution to independently converge on equivalent solutions repeatedly. Serine and cysteine proteases use different amino acid functional groups (alcohol or thiol) as a nucleophile. In order to activate that nucleophile, they orient an acidic and basic residue in a catalytic triad. The chemical and physical constraints on enzyme catalysis have caused identical triad arrangements to have evolved independently over 20 times in different enzyme superfamilies. Threonine proteases use the amino acid threonine as their catalytic nucleophile. Unlike cysteine and serine, threonine is a secondary alcohol (i.e. has a methyl group). The methyl group of threonine greatly restricts the possible orientations of triad and substrate as the methyl clashes with either the enzyme backbone or histidine base. Consequently, most threonine proteases use an N-terminal threonine in order to avoid such steric clashes. Several evolutionarily independent enzyme superfamilies with different protein folds use the N-terminal residue as a nucleophile. This commonality of active site but difference of protein fold indicates that the active site evolved convergently in those families. As more sequence data are becoming available, there is growing interest in convergent changes at the level of DNA and amino acids. In 2013 the first genome-wide study of convergence was published. Comparisons of the genomes of echolocating bats and the dolphin identified numerous convergent amino acid substitutions in genes implicated in hearing and vision. A classic comparison is between the marsupial fauna of Australia and the placental mammals of the Old World. The two lineages are clades—that is, they each share a common ancestor that belongs to their own group, and are more closely related to one another than to any other clade—but very similar forms evolved in each isolated population. Many body plans, for instance sabre-toothed cats and flying squirrels, evolved independently in both populations. 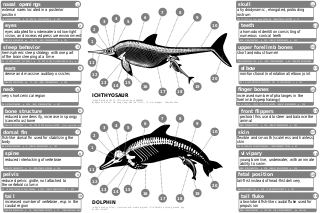 The same streamlined shape has been converged upon by fish (e.g., herrings), marine mammals (e.g., dolphins) and even the extinct ichthyosaur (Mesozoic era). This bodyplan is an adaptation to being an active predator in a high drag environment. It is also debated whether earless seals and eared seals are a single marine group, or represent two separate episodes of carnivorans turning to a marine environment. Vertebrate wings are homologous as forelimbs, being derived from the same organs; however, as organs of flight in pterosaurs (1), bats (2) and birds (3) they are analogous; they resemble each other in some ways, and they fulfill similar functions, but their roles in flight have evolved separately. A classical example of an analogy is the ability to fly in birds and bats. Both groups can move by powered flight, but flight has evolved independently in the two groups. The ability to fly does not make birds and bats close relatives. The ancestors of both bats and birds were terrestrial quadrupeds, and each has independently evolved powered flight via adaptations of their forelimbs. Although both forelimb adaptations are superficially "wing-shaped," they are substantially dissimilar in construction. The bat wing is a membrane stretched across four extremely elongated fingers, while the airfoil of the bird wing is made of feathers, which are strongly attached to the forearm (the ulna) and the highly fused bones of the wrist and hand (the carpometacarpus), with only tiny remnants of two fingers remaining, each anchoring a single feather. (Both bats and birds have retained the thumb for specialized functions.) So, while the wings of bats and birds are functionally convergent, they are not anatomically convergent. Similarly, the extinct pterosaur also shows an independent evolution of vertebrate forelimb to wing. An even more distantly related group with wings is the insects, they not only evolved separately as wings, but from totally different organs, starting from a fundamentally different bodyplan. Opposable thumbs allowing the grasping of objects are most often associated with primates, like humans, monkeys, apes, and lemurs. Opposable thumbs also evolved in pandas, however, and are completely different in structure, having six fingers including the thumb, which develops from a wrist bone entirely separately from other fingers. While they look almost the same, flying squirrels and sugar gliders are very different. Flying squirrels are placental mammals and sugar gliders are marsupials, which practically puts them at opposite ends of the mammal lineage. Humans are more closely related to flying squirrels than flying squirrels are to sugar gliders. As a sensory adaptation, echolocation has evolved several times, in cetaceans (dolphins and whales), as well as bats. Surprisingly, humans actually are capable of echolocation with training. Vertebrates and cephalopods developed the camera eye independently. In the vertebrate version the nerve fibers pass in front of the retina, and there is a blind spot, 4, where the nerves pass through the retina. 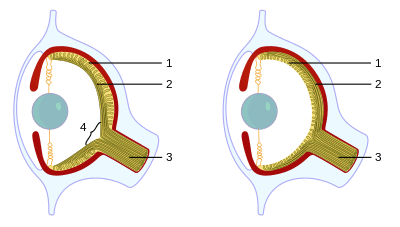 In the cephalopod version, the eye is constructed the "right way out", with the nerves attached to the rear of the retina. One of the best-known examples of convergent evolution is the camera eye of cephalopodss (such as squid and octopus), vertebrates (including mammals) and cnidaria (such as jellyfish). Their last common ancestor had at most a simple photoreceptive spot, but a range of processes led to the progressive refinement of camera eyes — with one sharp difference: the cephalopod eye is "wired" in the opposite direction, with blood and nerve vessels entering from the back of the retina, rather than the front as in vertebrates. This means that cephalopods do not have a blind spot. Insect mouthparts show many examples of organs which can be used to study convergent evolution in the context of form and function. The mouthparts of different insect groups consist of a set of homologous organs, specialised to the function of dietary intake of that insect group (which can be experimentally quantified). Convergent evolution of many groups of insects led from original biting-chewing mouthparts to different derived function types. They build a proboscis at flower-visiting insects for example, which are able to ingest food very efficiently or biting-sucking mouthparts, showing different function mechanisms at different groups of blood-sucking insects. While convergent evolution is often illustrated with animal examples, it has often occurred in plant evolution. For instance, C4 photosynthesis, one of the three major carbon-fixing biochemical processes, has arisen independently up to 40 times. About 7,600 plant species of angiosperms use C4 carbon fixation, with many monocots including 46% of grasses such as maize and sugar cane, and dicots including a sizeable minority of species in the Chenopodiaceae and the Amaranthaceae. Good examples of convergence in plants include the evolution of true fruits such as apples. 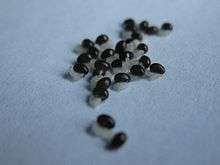 These incorporate one or more ovules and their accessory tissues, but many edible plant-derived tissues commonly regarded as fruits actually arise from very different embryological structures. This implies a convergent process in which genetically unrelated precursors assume a common form under selective pressure, in this case the competition for seed dispersal through consumption by animals. The emergence of seed dispersal by ants (myrmecochory) has evolved independently more than 100 times and is present in more than 11,000 plant species. It is also considered one of the most dramatic examples of convergent evolution in biology. Rasmussen, L. E. L.; Lee, Terry D.; Roelofs, Wendell L.; Zhang, Aijun; Daves, G. Doyle (1996). "Insect pheromone in elephants". Nature. 379 (6567): 684. Bibcode:1996Natur.379..684R. doi:10.1038/379684a0. PMID 8602213. 1 2 Reece, J; Meyers, N; Urry, L; Cain, M; Wasserman, S; Minorsky, P; Jackson, R; Cooke, B. Cambell Biology, 9th Edition. Pearson. p. 472. ISBN 9781442531765. ↑ Lomolino, M; Riddle, B; Whittaker, R; Brown, J. Biogeography, Fourth Edition. Sinauer Associates, Inc. p. 426. ISBN 978-0-878-93-494-2. ↑ Thunstad, Erik (2009). Darwins teori, evolusjon gjennom 400 år (in Norwegian). Oslo, Norway: Humanist forlag. p. 404. ISBN 978-82-92622-53-7. ↑ Online Biology Glossary Archived December 28, 2012, at the Wayback Machine..
1 2 3 4 Buller, AR; Townsend, CA (Feb 19, 2013). "Intrinsic evolutionary constraints on protease structure, enzyme acylation, and the identity of the catalytic triad.". Proceedings of the National Academy of Sciences of the United States of America. 110 (8): E653–61. Bibcode:2013PNAS..110E.653B. doi:10.1073/pnas.1221050110. PMC 3581919 . PMID 23382230. ↑ Rogers, E. A. 1943. "Who knows?" Hobbies—The Magazine for Collectors, June 1943, p. 101. 1 2 3 Conway Morris, Simon (2005). Life's solution: inevitable humans in a lonely universe. Cambridge, UK: Cambridge University Press. doi:10.2277/0521827043. ISBN 0-521-60325-0. OCLC 156902715. ↑ Chirat, R.; Moulton, D. E.; Goriely, A. (2013). "Mechanical basis of morphogenesis and convergent evolution of spiny seashells". Proceedings of the National Academy of Sciences. 110 (15): 6015–6020. Bibcode:2013PNAS..110.6015C. doi:10.1073/pnas.1220443110. ↑ Hennig, W., Phylogenetic Systematics. University of Illinois Press, Urbana IL, 1966. ↑ Collin, R.; Cipriani, R. (2003). "Dollo's law and the re-evolution of shell coiling". Proceedings of the Royal Society B. 270 (1533): 2551–2555. doi:10.1098/rspb.2003.2517. PMC 1691546 . PMID 14728776. ↑ Zhang, J.; Kumar, S. (1997). "Detection of convergent and parallel evolution at the amino acid sequence level" (PDF). Mol. Biol. Evol. 14: 527–36. doi:10.1093/oxfordjournals.molbev.a025789. ↑ ARENDT, J; REZNICK, D (January 2008). "Convergence and parallelism reconsidered: what have we learned about the genetics of adaptation?". Trends in Ecology & Evolution. 23 (1): 26–32. doi:10.1016/j.tree.2007.09.011. ↑ Pearce, T. (10 November 2011). "Convergence and Parallelism in Evolution: A Neo-Gouldian Account". The British Journal for the Philosophy of Science. 63 (2): 429–448. doi:10.1093/bjps/axr046. ↑ Dodson, G; Wlodawer, A (September 1998). "Catalytic triads and their relatives.". Trends in Biochemical Sciences. 23 (9): 347–52. doi:10.1016/S0968-0004(98)01254-7. PMID 9787641. ↑ Ekici, OD; Paetzel, M; Dalbey, RE (December 2008). "Unconventional serine proteases: variations on the catalytic Ser/His/Asp triad configuration.". Protein science : a publication of the Protein Society. 17 (12): 2023–37. doi:10.1110/ps.035436.108. PMID 18824507. ↑ Parker, J; Tsagkogeorga, G; Cotton, JA; Liu, Y; Provero, P; Stupka, E; Rossiter, SJ (2013). "Genome-wide signatures of convergent evolution in echolocating mammals". Nature. 502 (7470): , 228–231. Bibcode:2013Natur.502..228P. doi:10.1038/nature12511. ↑ Tietjen, William J. "Convergent Evolution Examples – Ecological Equivalents". The Spider Lab: The Internet's True Web Page. Louisville, KY, USA: Bellarmine University Department of Biology. Retrieved 2009-03-07. ↑ Lento, G.M. ; Hickson, R.E. ; Chambers, G.K.; Penny, D. (1 January 1995). "Use of spectral analysis to test hypotheses on the origin of pinnipeds". Molecular Biology and Evolution. 12 (1): 28–52. doi:10.1093/oxfordjournals.molbev.a040189. PMID 7877495. ↑ "When is a thumb a thumb?". Understanding Evolution. Retrieved 14 August 2015. ↑ Roberts MBV (1986) Biology: A Functional Approach Nelson Thornes, page 274. ISBN 9780174480198. ↑ Kozmik, Z; Ruzickova, J; Jonasova, K; Matsumoto, Y.; Vopalensky, P.; Kozmikova, I.; Strnad, H.; Kawamura, S.; Piatigorsky, J; Paces, V; Vlcek, C (1 July 2008). "From the Cover: Assembly of the cnidarian camera-type eye from vertebrate-like components". Proceedings of the National Academy of Sciences. 105 (26): 8989–8993. Bibcode:2008PNAS..105.8989K. doi:10.1073/pnas.0800388105. PMC 2449352 . PMID 18577593. Retrieved 3 May 2013. ↑ Krenn, Harald W.; Plant, John D.; Szucsich, Nikolaus U. (2005). "Mouthparts of flower-visiting insects". Arthropod Structure & Development. 34 (1): 1–40. doi:10.1016/j.asd.2004.10.002. ↑ Krenn, Harald W.; Gereben-Krenn, Barbara-Amina; Steinwender, Bernhardt M.; Popov, Alexi (2008). "Flower visiting Neuroptera: Mouthparts and feeding behaviour of Nemoptera sinuata (Nemopteridae)". European Journal of Entomology. 105 (2): 267–77. doi:10.14411/eje.2008.037. ↑ Bauder, Julia A.S.; Lieskonig, Nora R.; Krenn, Harald W. (2011). "The extremely long-tongued Neotropical butterfly Eurybia lycisca (Riodinidae): Proboscis morphology and flower handling". Arthropod Structure & Development. 40 (2): 122–7. doi:10.1016/j.asd.2010.11.002. 1 2 Wilhelmi, Andreas P.; Krenn, Harald W. (2012). "Elongated mouthparts of nectar-feeding Meloidae (Coleoptera)". Zoomorphology. 131 (4): 325–37. doi:10.1007/s00435-012-0162-3. ↑ name=Osborne2006> Osborne, C. P.; Beerling, D. J. (2006). "Nature's green revolution: the remarkable evolutionary rise of C4 plants". Philosophical Transactions of the Royal Society B: Biological Sciences. 361 (1465): 173–194. doi:10.1098/rstb.2005.1737. PMC 1626541 . PMID 16553316. ↑ Sage, Rowan; Russell Monson (1999). "16". C4 Plant Biology. pp. 551–580. ISBN 0-12-614440-0. ↑ Sage, Rowan; Russell Monson (1999). "7". C4 Plant Biology. pp. 228–229. ISBN 0-12-614440-0. ↑ Kadereit, G.; Borsch, T.; Weising, K.; Freitag, H (2003). "Phylogeny of Amaranthaceae and Chenopodiaceae and the Evolution of C4 Photosynthesis". International Journal of Plant Sciences. 164 (6): 959–86. doi:10.1086/378649. ↑ Lorts C, Briggeman T, Sang T (2008). "Evolution of fruit types and seed dispersal: A phylogenetic and ecological snapshot" (PDF). Journal of Systematics and Evolution. 46 (3): 396–404. doi:10.3724/SP.J.1002.2008.08039. Archived from the original (PDF) on 2013-07-18. ↑ Lengyel Sz; Gove AD; Latimer AM; Majer JD; Dunn RR (2010). "Convergent evolution of seed dispersal by ants, and phylogeny and biogeography in flowering plants: a global survey". Perspectives in Plant Ecology, Evolution and Systematics. 12: 43–55. doi:10.1016/j.ppees.2009.08.001.